SOTO Storm Breaker Multi-Fuel Stove. The versatile, easy-to-use multi-fuel StormBreaker stove is lightweight, convenient and efficient. Lightweight This easy-to-fold stainless steel, aluminum and brass stove with slip-resistant pot supports, hose, tank and fuel support controller weighs in at 443 grams and it works with liquid or fuel gas. 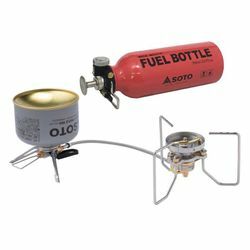 Convenient Switch from standard fuel canisters to white gas without swapping jets and even invert canisters for increased performance in cold weather conditions using the folding “wing stabilizer” that is included in the package. Efficient Cold and windy weather conditions? No problem with the StormBreaker. Cookware sits low to the burner head with a main flame of over 300 micro flames, utilizing the same wind-beating, low-profile, concave burner design that has earned SOTO’s WindMaster stove past awards, including Travel Tales HITT Seal of Approval for travel product excellence, Gear Institute’s Best in Class Award and the 2018 Alpine Institute’s Guide’s Choice. Faster boil time. Less gas consumption. The amount of fuel consumed depends on the type of fuel used. If using a liquid mixture, it will consume 250 grams in about 48 minutes. If using petrol, it will take about 96 minutes to go through 480 ml. Usage time * 2 / approx. 0.8 hours (when using one SOTO 250g gas canister) | approx. 1.6 hours when used with 480ml white gasoline. * 1 Calculated from burning data for 5 minutes from ignition in ambient temperature of 25 ℃. * 2 Calculated from burning data of 30 minutes from ignition in ambient temperature of 25 ℃.